Gloucester was first established as a settlement in 1623, three years after the pilgrims landed in Plymouth. The town of Gloucester was incorporated in 1642; it then included Sandy Bay, now the town of Rockport. Gloucester was named after Gloucester, England, whence many of the settlers of that year came. The origins of the Gloucester Fire Department began with the fire societies, men who banded themselves together for mutual protection. As early as 1789, when Cape Ann had a population of about 5,000 people, there was a Masonic Fire Society. The main purpose of these clubs was to fight fires but they also had rules, orders, and watchwords and met as a social group. Each man was provided with two fire buckets. These buckets were made of heavy leather and held about two gallons of water. When a fire alarm was sounded, either by firing three shots or by forcing open the door of the church and ringing the bell, the men gathered at the fire house where the engine (or a 'hand tub' as it was called in those days) was stored. This large tub was on a platform, mounted on wheels, and was drawn by men with ropes to the scene of the fire. Upon arrival at the burning building, the men with their buckets formed a long line from the nearest cistern or well and passed the filled buckets down the line to be emptied into the tub. There, men pumped the water by hand from the tub onto the fire. The empty buckets were passed back by a line of women. All this work was done without pay. 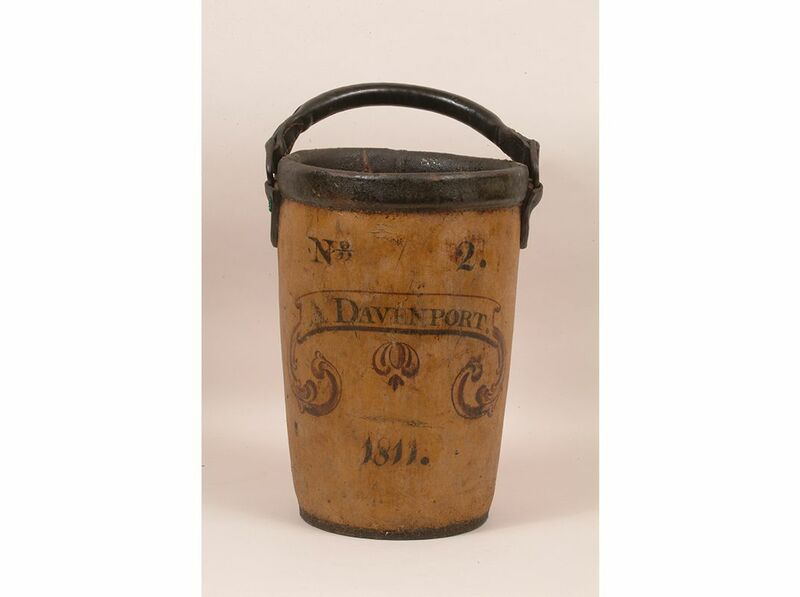 Each member of the Fire Society had his name on his buckets, and after the fire was extinguished and everyone had returned to the fire house, the men were able to identify and claim their own buckets. The first engine houses were on Middle Street near the Sawyer Free Library, and on Center Street. There were no records kept of the early fires but as the laws were very strict, the people were careful not to do anything that would cause damage by fire. The earliest fire engines all had names and they were called Volant, Cataract, and Extinguisher.